For the most part, people would say they are not being brought down by anyone. That is until they look further into their own situation. 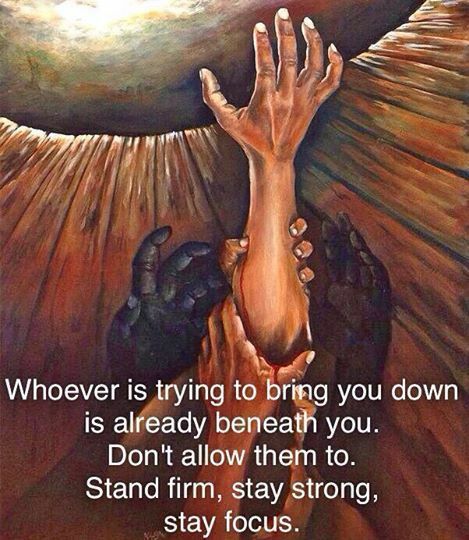 You see there are a number of ways that other people will try to bring you down. They attempt to bring you down either through their actions or by placing you in circumstances you could have never foreseen happening to you. In some cases you may think you have cut that person loose. That is until something happens that is not under your control. This is when you either get pulled down right along with them or decide to walk toward your new tomorrow. Do not be under the delusion that this is by any means easy, because it certainly is not. It can be as painful as walking away from your best friend. In August of 2000 I was faced with a similar challenge. I had been a smoker for a number of years. I REALLY enjoyed smoking. And I was like many other people who had one right before bed and one first thing in the morning. I kept up this regimen until I started having chronic bronchitis. At one point I had four prescriptions at the same time. Just the scent of a lit cigarette sent me into a coughing frenzy. Among all the other things that were happening, my mother had just had a major heart attack. It was on a visit to her at the rehabilitation hospital, that I went home a gingerly placed an entire pack of cigarettes in the trash. I placed them right on top.. just in case I might change my mind. I did not tell anyone what I had done. I picked up a bottle of water and started drinking it. Instead of carrying cigarettes with me everywhere, I carried a bottle of water. Before I knew what was happening a month had gone by. I was getting healthier by the day. My breathing was greatly improved. A year later I was into my new future, completely smoke free! I was no longer held down by cigarettes nor compromising my health for that matter! What should you walk away from that is trying to keep you down?